International Women’s Day has roots going back as far as the early 1900’s. A hundred years later, it is now a big deal. IWD is a day to celebrate the economic, cultural, and political achievements of women, and also marks a call to action for accelerating gender parity. In the last few years, I have seen a huge surge in the amount of media covering all-things-women to celebrate IWD on March 8th. So, if you have a stake in women’s rights and feminism it is a great time to reach out to the media and let them know. 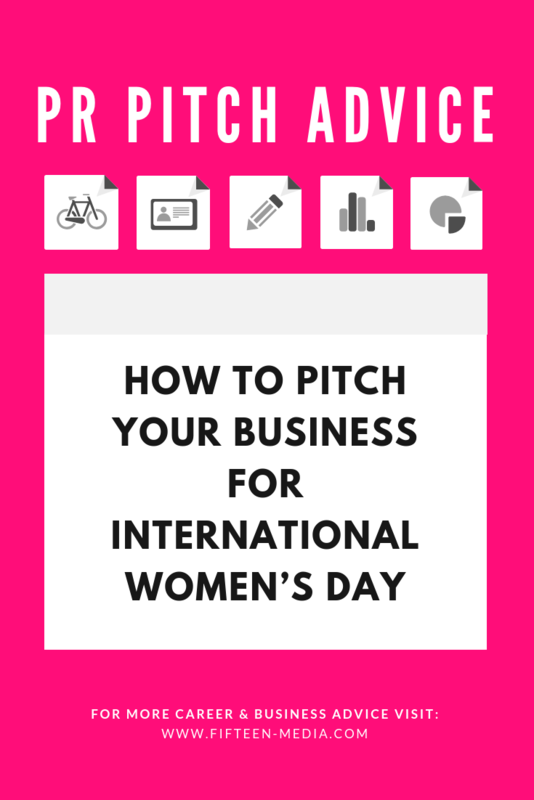 Here are a few tips for pitching your business for IWD. Actually, starting early is a cornerstone for any and all pitching. Major magazines work 3-6 months in advance. Regional magazines will be a little less than that. Online publications, especially those that publish daily, will have more flexibility closer to the date, but you should still start sending your pitch ASAP. Even though it’s better to pitch sooner rather than later, it is still worth pitching late, just in case something drops out or is needed last minute. That being said, I have way more success when I pitch early. One of the easiest ways to know who to pitch is to look at who did roundups last year. If you just google International Women’s Day in Google News or something along the lines of International Women’s Day gifts, you can pitch the same people and publications that covered the story last year. Products that give back to a women’s related cause. Expert tips for women to conquer the world (or at least make a more equitable world). If you don’t have anything on your shelf that fits the bill, get creative! In a quite literal example from last year, a number of creative agencies received media attention for the celebrating IWD with initiatives like “sorry” jars and using their internal talent to release illustrations of fearless females. Many major brands including McDonald's, Johnny Walker, and Barbie got on board by changing up their logos, packaging, and releasing new products for the month. If you are an expert, you shouldn’t be left out. Maybe you have something that you have used in your life to shatter that glass ceiling and you can share the advice with other women. For example, there was a great article about fifteen chefs and the women who inspire them, highlighting the women who are making a difference in a male-dominated field. And another article from Thrillist highlighted the “Leading Ladies Behind NYC’s Most Badass Woman-Owned Businesses” It wasn’t about the products, it was about the women. The one thing I will caution is to be genuine in helping women. Just about the worst thing you can do is create a “pink tax” by making a normal product pink and charging more for it. That doesn’t celebrate women, it’s just a gimmick. The brands that do an IWD stunt for publicity rather than making real change for women are either ignored or blasted in the media. It’s not enough to say you’re for women, you have to actually follow through. In fact, market editor for Refinery29, Alyssa Coscarelli, published some guidelines they require brands meet before they consider giving free publicity in the name of IWD. Not all publications will be this strict, but it is good to remember that IWD is not a reason to buy more stuff, it’s for real change. My last tip is to be on-theme. Each year the International Women’s Day organization chooses a theme. The 2019 theme is #BalanceforBetter. It’s about creating a more gender balanced world. They’re also encouraging the physical symbol of making a “W” with your arms to represent women and balance. But in any case, using the theme might help set you apart from those who don’t. If this all sounds good to you but you’re not sure how to write a pitch or need a little help understanding the ins and outs of PR, get in touch. I have workshops available for any price point that can be tailored for your business and industry.